When outside temperatures warm up, snakes come out of their burrows to start the mating process and to get warm. They are the most active in the early evening just before sundown but can be seen at any time during the day. There are many types of venomous snakes in the United States, including rattlesnakes, copperheads, cottonmouths and coral snakes. They can be extremely dangerous to all outdoor workers. Avoid climbing on rocks or piles of wood. Wear boots and long pants when working outside. Find out what snakes are possible in your area – even the State of Wisconsin is home to venomous snakes! A pair of puncture marks at the wound. Redness and swelling around the bite. Severe pain at the site of the bite. Seek medical attention as soon as possible (dial 911). Try to remember the shape/color of the snake. Keep calm and still to slow the spread of venom. Lay/sit with the bite below the level of the heart. Pick up the snake or try to trap it. Wait for symptoms to appear, seek immediate medical attention. Apply ice or immerse in water. Don’t stick your hands down holes, under ledges, in brush or under rocks. When gardening, inspect concealed areas where rattlesnakes could be. If you encounter a rattlesnake, head in the other direction. Rattlesnakes usually don’t strike from a prone position, but they will if the circumstances call for it. Generally, they coil, rattle their tails and strike. Their reach is almost as long as their body, so give them a wide berth. 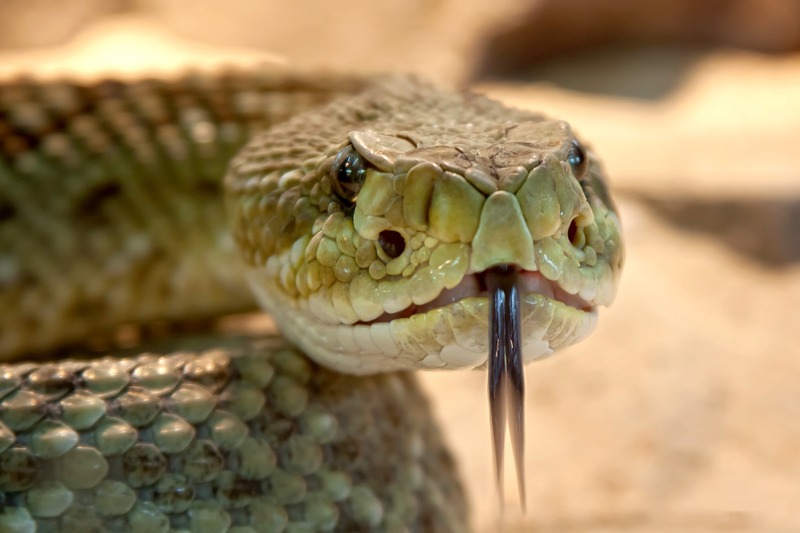 About 25 percent of the time, rattlesnake bites are “dry,” meaning they don’t inject any venom. However, a bite from any snake should be treated by medical professionals to avoid infections. Learn to tell the difference between a rattler and other types of snakes before you encounter one. Rattlesnakes have flat, triangular shaped heads and, if they are old enough, will have rattles on the ends of their tails. Rattlesnakes are deaf, but they are sensitive to vibrations. They won’t hear you coming, but they will pick up on your footsteps. Morris, Joan. “How to Stay Safe as Rattlesnakes Start Emerging from Their Winter Dens.” The Mercury News, The Mercury News, 14 Mar. 2018, www.mercurynews.com/2018/03/14/how-to-stay-safe-as-rattlesnakes-start-emerging-from-their-winter-dens/. “Safety-and-Training -Venomous-Snakes.” Edison Power, 23 Apr. 2015, www.edisonpower.com/safety-and-training/safety-blog/venomous-snakes. So We All Go Home Safe - Work-life Lessons Safe + Sound Week is Here!